Has Sunday River gone all Beaver Creek on us? A recent dining experience has me thinking the Chondola has changed more than the skiing at Maine’s largest ski resort. It’s brought top shelf dining to the ski scene. In fact, its one of our favorite ski resort dining places in the East. I feel like I am at Deer Valley. I have just ridden a gondola with moonlight and stars over head, skiers and snowboarders schussing the lit slopes below. My friends and I stay warm inside the swift gondola car under a cozy blanket the lift attendant provided. Arriving at the summit of North Peak, we walk a short snowy path amidst skiers heading for their night runs on groomed white carpet trails. But we follow the Red Carpet (I am not making this up) into Sunday River’s mid-mountain Peak Lodge. Bubbly Champagne flutes are handed to us as we enter the Lodge, and our coats are whisked away. The same place I clomped through in ski boots hours before has been transformed with candlelight, sparkling trees, tablecloths and elegantly dressed servers – no cafeteria trays or cash registers in sight. A magical mountaintop evening unfolds, as we sip Champagne and socialize with fellow skiers over hors d’oeuvres of handmade sushi and bacon wrapped scallops, listening to live music. Then we are seated for a four course dinner, including Lobster Bisque and Tenderloin, that is delicious and not remotely reminiscent of the lunch time ski lodge fare. Outside skiers glide past the floor to ceiling windows as reminder of our high elevation dinner location. Dining at Peak Lodge beats night skiing in my book. But that’s the beauty of this on mountain meal, you can dine as civilized adults, enjoy witty banter about your day on the slopes, even dance to the live entertainment throughout your evening. Meanwhile your kids can make laps on the Chondola and get a $3 piece of pizza at The South Ridge Lodge. It’s a winner winner dinner. You must make advanced reservations to Dine at the Peak on Saturday nights, its $50 per person typically and $75 on theme nights where wine pairing is included. Sunday River has also created Camp at the Grand Summit Hotel offering Maine comfort food with a cozy LLBean style lodge decor. Entertainment is offered certain evenings at Camp off the Hotel lobby and the ambiance is warm inviting and very Maine. 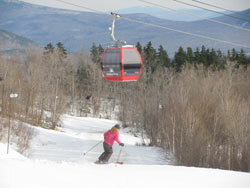 Sugarloaf has its own on mountain dining at Bullwinkle’s on Saturday nights, and Wednesday during holiday weeks. At the Loaf, you rumble up the mountain in a snow cat to the cozy cabin of Bullwinkle’s. Candlelight awaits, along with a four course Chef prepared meal of entrées befitting a mountain top cabin – elk, rabbit, and boar. The Bullwinkle’s evenings are $99 per person, which includes the cat ride. I have dined at other rather haute elevations. Banff Lake Louise in Canada offers a “Downhill at Dusk” event that even Kelly Ripa from Live with Kelly raved about. You enjoy après ski at the mid mountain White Horn Lodge while other skiers exit the slopes, then you ski down after dinner with headlamps affixed to your forehead after a few hours of drinking and dancing. The concept is cool, but skiing in the dark after drinking can be pretty crazy – Canadian style. At Colorado’s Steamboat you ride the gondola, then take a sleigh ride to a mountaintop dinner at Ragnar’s Lodge. 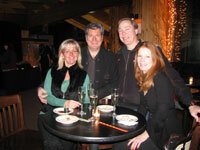 Beaver Creek hosts dinners at Beano’s Cabin, you are delivered by sleigh to a gourmet dinner at the fireplace lodge. In Idaho, you can ride a sleigh or snowshoe your way to the 1937 Trail Creek Cabin for a remote romantic dinner Sun Valley style. Maine is now on the map offering VIP dining for the vertically inclined, in the league with these world class ski resorts. Of note, you don’t have to be a skier to enjoy this extraordinary evening. It would be novel to bring your non-ski friends up the Chondola to be part of the ski scene for an evening, without having to don ski equipment. Even for experienced skiers, I don’t recommend you ski down after your wining and dining event. Wear your warm jacket and your dancing shoes, leave the ski boots on the boot dryer at home and try a Peak dining experience in Maine this winter.